“Exclusive Or” solo mode is one of my favourite features. I use it all the time as unless you use a control surface it can be awkward to make comparisons between two tracks. Comparison is essential when mixing and I’m very wary of anyone who believes they don’t need to do it. Our ability to compare subtle differences between alternatives is fragile and I really value the ability to swap between tracks with no interruption in the time it takes me to cancel one solo and engage the next. If you are using a control surface then hitting both solos at the same time is easy but if you are using a mouse then X-OR solo mode cancels previous solos when engaging a new one making comparison instantaneous. When in X-OR mode this behaviour can be suspended by control-clicking (Start click on a PC). To switch solo modes go to the options menu. X-form offers the highest quality pitch and time shifting available in Pro Tools. It is available as an elastic audio algorithm, with the TC/E trimmer and as an Audiosuite process. It differs from the other available algorithms for elastic audio in that it is not available as a real-time process and has to be rendered. Apparently the algorithm used is based in the Radius algorithm from iZotope. It is common practice to use the most appropriate real-time elastic audio algorithm and swap it for X-form for the final pass. X-form is available to everyone as an elastic audio algorithm but the Audiosuite version is a paid-for option. Unlike the real-time elastic audio algorithms X-form offers no controls beyond switching in a preserve formants button and the ability to turn down the quality (it’s faster that way but why would anyone want to turn down the quality of an offline process?). 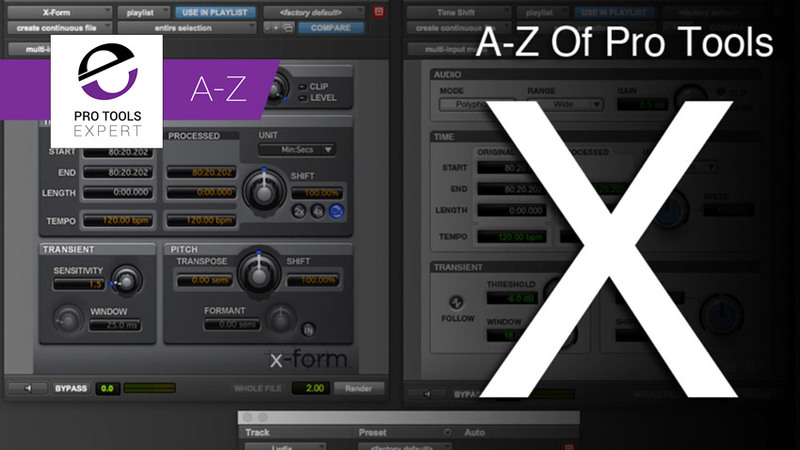 When using X-form as an Audiosuite plug-in detailed controls are available. If you compare the X-form window with the Time Shift window you will see the the controls on offer differ only slightly. Time Shift is very capable but in my experience X-form does have the edge. While X-form offers 800% timestretch as opposed to the 400% offered by Time Shift the results will get weird long before that. Both offer the ability to timestretch/compress and pitch shift independently of each other with the added hilarity of formant shifting - turning male voices female (formant up) or making everybody sound terribly sad (formant down) - instant crowdpleaser! If you are reducing the duration or raising the pitch of the audio being processed it may be necessary to attenuate slightly to avoid clipping. Use for post production pull up and pull down tasks is straightforward and a full set of presets exist though these are also supplied for Time Shift. When using the TC/E trimmer you can specify which timestretch algorithm gets used during trimming. Time Shift is the default in this application but X Form can be specified as can the Digidesign TC/E algorithm which was sorely missed by dialogue editors when it was removed in v11.0. So thats X covered and I’ve only just realised I could have done Xpand2 instead. This has been covered in detail many times by Russ, just type Xpand into the search bar on the front page of the site and you’ll find loads of content reminding us just how good Xpand is. I love Xpand2 but I’ve always disliked the “Beneath the Waves” pad being the default. To change this just select a patch you’d prefer to use instead (I use “Basic Mark 1”), save it as a user preset and set that user preset as your user default. Then just select Settings Preferences - Set Plug-in Default to - User Setting and you’ll never have to hear that swooshy-wooshy pad ever again.